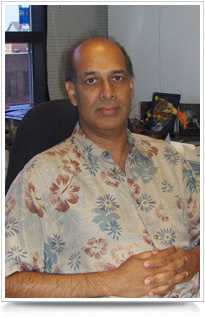 Khalid Sayood received his undergraduate education at the Middle East Technical University, Ankara, Turkey, and the University of Rochester, Rochester, NY. He received the B.S. and M.S. degrees from the University of Rochester, and the Ph.D. degree from Texas A&M University, College Station, TX, in 1977, 1979, and 1982 respectively, all in electrical engineering. He joined the Department of Electrical Engineering at the University of Nebraska-Lincoln in 1982, where he is currently serving as Henson Professor of Engineering. He spent the 1995-1997 academic years at the TUBITAK Marmara Research Center and Bogazici University in Turkey. He is the author of "Introductionto Data Compression," now in its second edition, and the editor of "The Lossless Compression Handbook." M.A. Larson, O.U. Nalbantoglu, K. Sayood, E.B. Zentz, R.C. Cer, P.C. Iwen, S.C. Francesconi, K. Bishop-Lilly, V. Mokashi, A. Sjostedt, S. H. Hinrichs, "Transfer of Wolbachia persica to the genus Francisella and reclassification as Francisella persica comb. nov. with emended description of the family Francisellaceae.," International Journal of Systematic and Evolutionary Microbiology, January 2016. O.U. Nalbantoglu and K. Sayood, "Data Compression," Computer Science Handbook, ed. T. Gonsalez, CRC Press, 2014. K. Sayood, "Digital Image Formats," Digital Image Forensics ed. H.T. Sencar and N.Memon, Springer 2013. O.U. Nalbantoglu, D.R. Russell, and K. Sayood, "Data compression concepts and algorithms and their applications to bioinformatics ", Entropy. 12(1):34-52, 2010. D.J. Russell, H.H. Otu, and K. Sayood, "Grammar-based distance in progressive multiple sequence alignment," BMC Bioinformatics, July 2008. M. Bauer, S.M. Schuster, and K. Sayood, "The average mutual information profile as a genomic signature," BMC Bioinformatics, January 2008. H.Wang, S.D. Babacan, and K. Sayood, "Lossless Hyperspectral Image Compression Using Context-based Conditional Average," IEEE Transactions on Geoscience and Remote Sensing, December 2007. H.H. Otu and K. Sayood, "A New Sequence Distance Measure for Phylogenetic Tree Construction," Bioinformatics, April 2003. H.H. Otu and K. Sayood, "A Divide and Conquer Approach to Sequence Assembly," Bioinformatics, January 2003. B.D. Pettijohn, M.W. Hoffman, and K. Sayood, "Joint Source/Channel Coding Using Arithmetic Codes," IEEE Transactions on Communications, May 2001. K. Sayood, H.H. Otu, and N. Demir, "Joint Source/Channel Coding for Variable Length Codes," IEEE Transactions on Communications, May 2000.